While progress on organic thin-film photovoltaics is rapidly growing, inorganic devices still hold the record for highest efficiencies which is in part due to their broad spectral absorption and excellent electronic properties. Considering the recorded higher efficiencies and lower cost per watt compared to organic devices, combined with the enhanced thermal and photo stability of bulk-scale inorganic materials, Townsend, in his 2014 study, focused on an all-inorganic based structure for fabrication of a top to bottom fully solution-based solar cell. A major disadvantage compared to organics, however, is that inorganic materials are difficult to deposit from solution. To overcome this, Townsend synthesized materials on the nanoscale. Inorganic nanocrystals encased in an organic ligand shell are soluble in organic solvents and can be deposited from solution (i.e., spin-, dip-, spray-coat) whereas traditional inorganic materials require a high temperature vacuum chamber. The solar devices are fabricated from nanoscale particle inks of the light absorbing layers, cadmium telluride/cadmium selenide, and metallic inks above and below. This way, the entire electronic device can be built on non-conductive glass substrates using equipment you can find in your kitchen. The outstanding challenge facing the (3-5 nm) inorganic nanocrystals is that they must be annealed or heated to form larger ‘bulk scale’ grains (100 nm to 1 μm) in order to produce working devices. Townsend recently teamed with Navy researchers to explore this process. A spray-on nanocrystal solar cell array. In his latest study, published this year in the Journal of Materials Chemistry A, Townsend, along with Navy researchers, found that ammonium chloride is a non-toxic, inexpensive viable alternative to cadmium chloride for nanocrystal solar cells. This discovery came after testing several different salts. Devices made using ammonium chloride (which is commonly used in bread making) had comparable device characteristics to those made with cadmium chloride, and the move away from cadmium salt treatments alleviates concerns about the environmental health and safety of current processing methods. The team also discovered that the role of the salt treatment involves crucial ligand removal reactions. This is unique to inorganic nanocrystals and is not observed for bulk-scale vacuum deposition methods. “A lot of exciting work has been done on nanocrystal ligand exchange, but, for the first time, we elucidated the dual role of the salt as a ligand exchange agent and a simultaneous sintering agent. This is an important distinction for these devices, because nanocrystals are typically synthesized with a native organic ligand shell. This shell needs to be removed before heating in order to improve the electronic properties of the film,” said Townsend about the discovery. Because nanomaterials are at the forefront of emerging new properties compared to their bulk counterpart, the study is important to the future of electronic device fabrication. 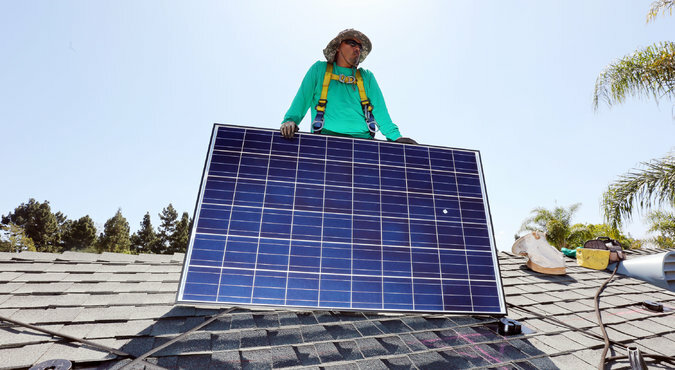 The research comes in the wake of the Obama Administration’s announcement in July to put more solar panels on low-income housing and expand access to solar power for renters, and recent pledge to get 20 percent of the U.S. total electricity from renewable sources by the year 2030. “Right now, solar technology is somewhat unattainable for the average person,” said Townsend. “The dream is to make the assembly and installation process so cheap and simple that you can go to your local home improvement store and buy a kit and then spray it on your own roof. 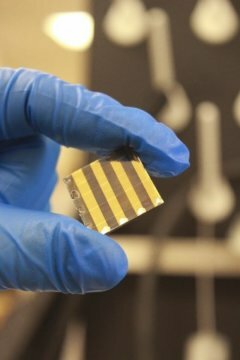 That is why we we’re working on spray-on solar cells.” Townsend plans for further research to increase the efficiency of the all-inorganic nanocrystal solar cells (currently reaching five percent), while building them with completely non-toxic components. The above post is reprinted from materials provided by St. Mary’s College of Maryland. Note: Materials may be edited for content and length. This entry was posted in Nanotechnology and tagged Nano Solar Cells, Nano-Crystals, Nanotechnology, Solar cell, Thin film, US Naval Research.